Honorable W. Patrick Donlin Assembly #1205 of the Knights of Columbus purchased an American Flag with staff and stand for the Price County Sheriff's Department Honor Guard. The 4th Degree is the patriotic branch of the Knights of Columbus. 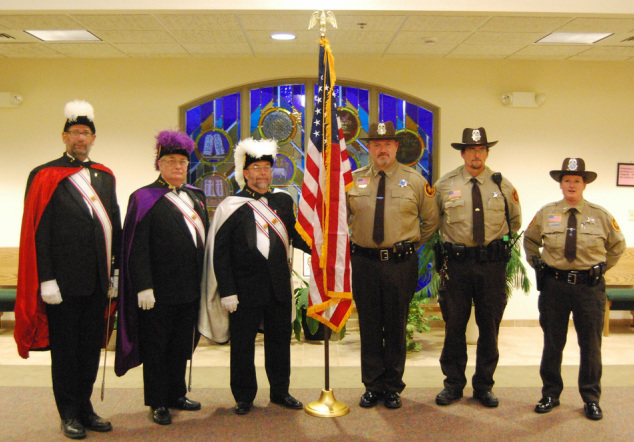 At left are members of the Knights of Columbus Honor Guard, and at right are members of the Price County Sheriff's Department Honor Guard. From left are Doug Stanke, KC Honor Guard Commander Elvin Tanner, Assembly #1205 Faithful Navigator Dennis Ashbeck, Deputy David Wesenick, Deputy Joe Lillie, and Deputy Laurie Zondlo.